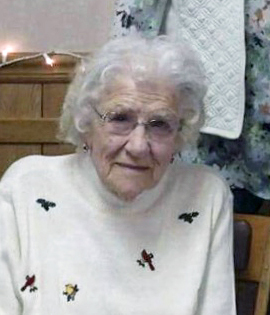 Obituary for Ila Mae (DeArment) Partridge | Robert L. Snyder Funeral Home and Crematory Inc.
Ila Mae Partridge, Glenn School Road, Sandy Lake (Mill Creek Twp.) passed away peacefully in the comfort of her home early Sunday morning, November 25, 2018 following a period of declining health. She was 90. Ila was born in Meadville, PA. on March 7, 1928 a daughter of the late Edward George and Josephine Elizabeth (Mapous) DeArment. On July 17 1946 she married Joseph S. Partridge who preceded her in death on Oct. 17, 1984. She was a homemaker, a wonderful cook who enjoyed cooking for her family, and enjoyed watching QVC. She had been a member of the Sandy Lake Order of the Eastern Star, Chapter 110, The Sandy Lake Rebekah Lodge and the former Sandy Lake Grange. Ila is survived by a son, Lee Arnold Partridge and his wife Myrna Lee of Deltona, Florida; two daughters, Carol Ann Partridge, Jamestown and Melinda Jo Spottswood and her husband Bob of El Cajon, CA. ; Two brothers, Ralph DeArment, Centerville and Howard DeArment, TN; a sister, Lucille Staley, Clarion; 8 grandchildren, Curtis Partridge, April Bogard, Jason Stamp, Jessie Stamp, Jordan Stamp, Scott Andrew Liese, Danielle Liese and Stephen Spottswood and numerous great grandchildren. The funeral service will be held at 11:00 am on Saturday, December 1, 2018 at the Robert L. Snyder Funeral Home and Crematory Inc. 3223 Perry Hwy., Sheakleyville with Rev. Kenneth Saul, assistant pastor of the First Church of God, Greenville officiating. Ila will be laid to rest next to her husband at the Sheakleyville Cemetery. Family and friends may call at the funeral home on Friday from 2:00 – 4:00 pm and 7:00 – 9:00 pm. Memories and condolences may be shared with the family online at www.snyderfh.com.